Home Issues	Lettuce or Lamb? More than 16 billion animals are killed each year in the U.S., according to PETA. They’re used to feed and clothe America, but at the detriment of the animals and of the environment. The average meat-eating American’s diet contributes greenhouse gas emissions that are 85 percent produced by the raising and killing of animals. A majority of the meat raised in the U.S. are from concentrated animal feeding operations. Doug Gurian-Sherman, an executive at the Union of Concerned Scientists, published an investigation of CAFOs (Concentrated Animal Feeding Operations) that found the operations perpetuate animal and human rights abuses. Even more upsetting, CAFOs are largely subsidized by the government and are therefore less-expensive for producers and consumers. So, what are the alternatives? Veganism is the most radical form of meat abstention and involves not eating any animal byproducts. This diet falls within a pretty broad spectrum in the vegan community, as some even refuse to eat anything processed by a company that also sells meat. Farm Sanctuary is a local organization that promotes farm animal protection and vegan living. They rescue animals who have been abused by their owners or who had been previously harmed in the farming process. Nick Cooney works as the compassionate communities campaign manager for Farm Sanctuary and said: “The goal is to have animals act as ambassadors for education and outreach,” allowing people to see the real beings that go into their food. The farm rescues animals from meat and dairy production. “We’re usually called when there’s an abuse situation or some other violation,” Cooney said. At Farm Sanctuary, animals are provided a home where they are free to live until they die naturally. Cooney said this allows the animals to be seen by the larger community, which spreads awareness. “The goal is mostly education … using these animals to spread awareness and letting people make their own change,” he said. In this respect, Farm Sanctuary allows people to make informed choices about their own diets, more so than encouraging all farms to end their use of animals for food. Vegetarianism is a diet that excludes any animal flesh but includes animal byproducts. This form of meat-avoidance does prevent some of the harmful environmental impacts of eating animals and their byproducts. Most of the methane released by large farms is produced by cows and pigs cultivated for their meat. Furthermore, this is where some of the most cruel treatment of animals occurs. While veganism requires a shift to a mostly legume-based diet — and usually the addition of vitamin supplements, since there are very few natural sources of Vitamin B12 or Fatty Acids in a vegan diet — in a vegetarian diet there are still sources of protein like cheese and eggs. Carol Adams wrote in her book The Sexual Politics Of Meat that eating meat is a symbolic way of accepting traditional patriarchal structures. She points to several commercials and advertisements that have drawn almost direct comparisons between women and meat. By refusing to eat animals and instead sustaining themselves with grains and greens, Adams said women can take a stand against the structures that seek to oppress them. Since this stand is entirely symbolic, there is no specific dietary structure that needs to be associated with it except abstaining from meat. Pescatarians are much like vegetarians in that they don’t eat most meats, but they do eat fish. This is often categorized as a type of vegetarianism. The diet avoids many of the obvious cruelties of the meat industry, like the farming and killing of cows, pigs and chickens, but it does not avoid some of the cruelties perpetrated in the name of fishing. Large shrimp nets have been known to catch endangered sea turtles and other underwater mammals in their wake. Senior Rachel Orlow has been a pescatarian for two and a half years. She started the diet her freshman year after eating at the dining halls. “My stomach has always been sensitive and the food just used to make me feel sick,” Orlow said. “So I cut out meat and I just tried to not eat dairy and that helped.” She gradually started eating dairy and fish again but has stayed away from other meats. As a food photographer, Orlow said she was really interested in knowing where her food came from and how it was made. “That’s one of the nicest things about being in an apartment, being able to control what’s in my food, how it’s made,” Orlow said. One dietary option not meat-free is to eat only meat from small, sustainable farms. Unlike CAFOs, these farms do not contribute to environmental destruction and animal cruelty. They are generally small in size and self-sustaining, like the McDonald Family Farm located in Romulus, N.Y. Peter McDonald said he has three criteria for sustainable eating: clean, fresh and local. Though he said these three do not always come together. 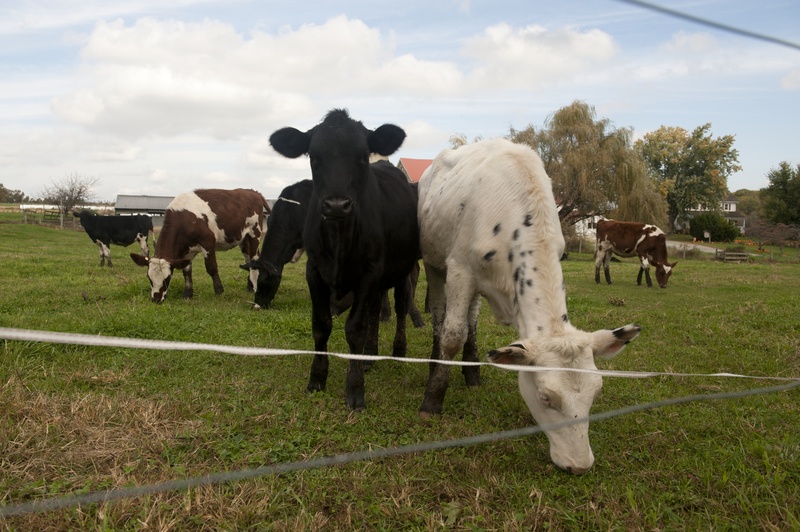 “It’s become clear now that grass fed meat is actually very healthy for the human body,” McDonald said, emphasizing that cows and pigs’ natural grazing and growing patterns are better for the animals and the people who eat them. Farms run like McDonald’s, though still resulting in the slaughter of animals, do develop a relationship between the farmer, the animals and the land itself. Unfortunately, it can be hard to determine which farms are really sustainable and it can often be expensive, but with a little research and time, places like McDonald Farm can be found. 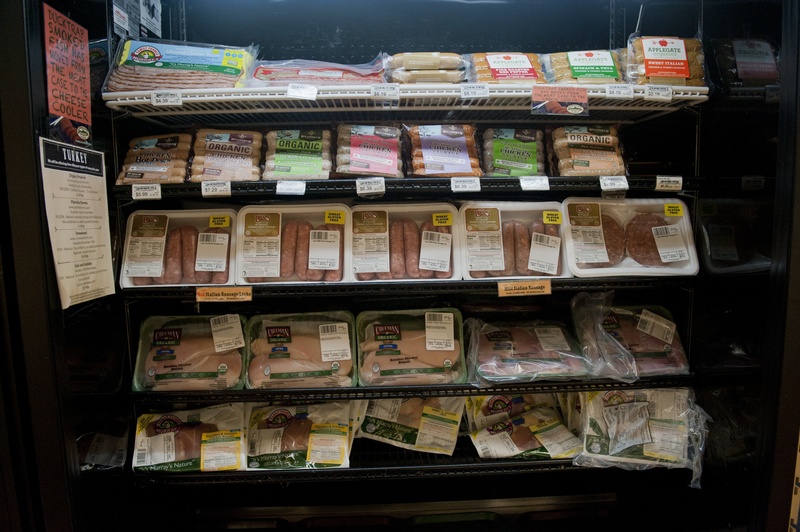 Roughly five percent of Americans identify as vegetarian, according to a 2012 Gallup poll. Only two percent identified as strict vegans. These numbers have not dramatically increased since similar polls taken in the early and mid-nineties, nor do they reflect an increase in people who identify themselves as “flexitarians” — people who eat some dairy and meat products but not regularly, and largely from sustainable sources. In a nationwide survey by the Vegetarian Research Group, 22.8 million people reported a “vegetarian-inclined” diet — indicating that they either often ate vegetarian meals or took care to use sustainable sources for their meat products — as opposed to the 7.3 million who identified as strictly vegetarian. Responses like these show that U.S. consumers are becoming more conscious of where their food comes from, and what kinds of farming practices they want to support. While a nationwide shift to veganism is not in the country’s immediate future, the U.S. has seen a growth in small, sustainable farms and consumers who support them. Ysabel Mullarky is a freshman applied psychology major who thinks plants have feelings too. Email her at ymullar1[at]ithaca[dot]edu.